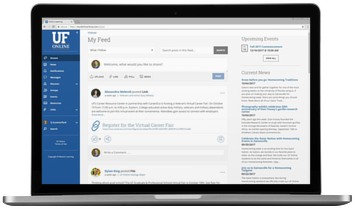 The Plaza is an online community center for all UF Online students. Within the Plaza, you are able to receive the latest news about UF, join groups of students based on your location, major or specific classes, and even interest area. You have the ability to start your own group based on potential connect points to other students. You can even customize your news feed to receive the information that is most important to you. The Plaza is your place to connect, collaborate, and be part of the UF Online Community!